We didn't have a wedding list. Each to their own, but I think they're a bit cheeky. And often uninspired. Full of sensible items to give Aunty-Mary-who-buys-you-a-LOVELY-knife-block a sense of satisfaction rather than the happy couple a frisson of genuine pleasure and excitement. Which, as I tell the kids at school, is a crap adjective for anything. Being of Celtic persuasion, I knew that my lot would give us money. Yusss siree. It's a bit gypsy-esque, but at any wedding I've ever been to in the homeland there comes a point where bulging cards are surreptitiously passed from relative to Bride or Groom or Father of the Bride or worrever. So that bit was easy. We debated whether to write anything about presents on the invitation, too, but decided that, too, was a bit cheeky and liable to get a bit vomit-inducing: 'We have everything we could possibly want in each other and in you sharing our VEWWY SPECIAL DAY WITH US, but if you WOULD like to flash some cash then...' You know? Like I say, each to their own. I suppose I was absolved from a more difficult decision by the fact that I KNEW my lot would bring money and we wouldn't, therefore, be inundated with crap presents from a significant number of guests. For the rest of folk, I figured if they wanted to buy us a gift, they would. 'But what can we get you?!' some people wailed. Ooo, he's maddening, ain't he? But oh my word, did some people live up to the 'be creative' brief. Not a toaster in sight. So over a few posst I'll take you on a tour through my favourite gifts. You might find an idea or two for weddings that you're going to yourself where the bride and groom have been similarly maddening and given their poor guests absolutely no indication as to what they might like. Although this first one is kind of hard to copy. Behold the 1951 General Electric Co Bakerlite Valve Radio. Now, OK, we have some cool friends, and Josie and Jon are amongst the coolest. Effortlessly cool in a 'my-parents-are-antique-dealers-and-my-eyeliner-is-always-on-the-perfect-side-of-smoky-and-I-am-sooo-wearing-a-vintage-hat-to-your-wedding-darling' way. But they realy surpassed themselves here. Get this. They bought the radio, re-conditioned it and got it working and then made us a little auction-house style write-up in their wedding card. And we nearly cried when we opened it. But then we got a grip and turned it on. And, like Jos had written on the card, once the left had knob had been 'twizzled', it took a few seconds to warm up...and then the sound crackled and broke through...and the cricket was on! I felt like I had fulfilled all of my Quantum Leap dreams and JUST STEPPED INTO THE 50s. So, what's the moral of the story? 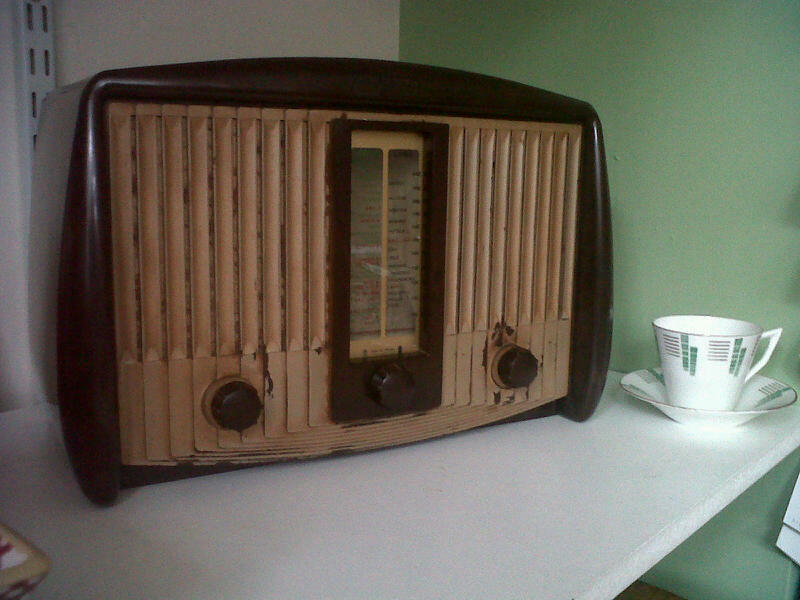 If you want to make your slightly-geeky friends very, very happy, you need to buy and recondition a bakelite radio for them? Mebbes not that precisely. But personal presents (err, what do Laura and Adam like? Old stuff. And the radio. I KNOW!) are just the bestest. AMAZING - look at that beaut! Wedding lists are so damn tricky. I too want people to be creative but some of them just errrm...aren't!!! But, well we've had a toaster for 5 years now and not even Mr D can find a use for 2! No solution found yet but here's to someone producing something even nearly as completely&utterlybloodybrilliant as that!! We were trusted with feeding our friends' cat when they went on honeymoon, so we knocked out their fireplace (they'd been meaning to do it for ages), plastered it up and painted their front room for them while they were away (knew they wanted a muted green.. clocked the sage colour of their BMs dresses..decision made). They were over the moon when they got home! They've bought us festival tickets for our wedding this year :) Creative/thoughtful presents are the ones you remember. Really?! You are VERY GOOD FRIENDS. And brave! So agree about the word 'nice'. Looking forward to reading your accounts of the two weddings, and more photos of your gorgeous short dress.